This is for a Fleur De Lis Mirrored Wall Sconce Dramatic Wall Centerpiece from Shopatusm. A little French flair that will reflect your dazzling eye for design! 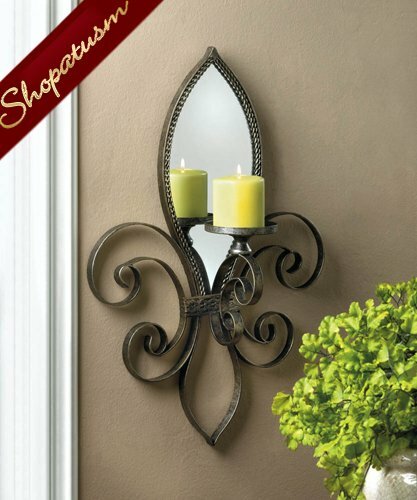 This is truly a unique and beautiful candle sconce, with an iron frame and mirrored back, that will make a stylish statement on your wall. Add the candle of your choice. Item weight: 3.8 lbs. 15 1/4" x 5 1/8" x 22" high. Iron and glass. Candle not included.